We have personal boundaries, personal property lines, in our relationship with God. God has designed the world so that boundaries are to be respected. He respects ours, and we need to respect His. God respects our boundaries in many ways. First, He leaves work for us to do that only we can do. And He allows us to experience the painful consequences of our behavior so that we will change. He is not willing for any of us to perish and takes no pleasure in our destruction (2 Peter 3:9; Ezekiel 18:23), but He wants us to change for our own good and His glory. It hurts Him deeply when we don’t. But at the same time, He does not rescue us; He wants us to work it out for our own good. He will not violate our wish to be left alone, although He will plead with us to come back to Him. Second, He respects our no. He tries neither to control nor nag us. He allows us to say no and go our way. Think of the parable of the prodigal son, the story of the rich young ruler, or the story of Joshua and his people. In all of these examples, God gives a choice and allows the people involved to make up their minds. When people say no, He allows it and keeps on loving them. He is a giver. And one of the things He always gives is a choice, but like a real giver, he also gives the consequences of those choices. He respects boundaries. Many people are not as honest as these biblical characters were, however. The prodigal son was direct and honest: “I do not want to do it your way. I’m going to do it my way.” We are more often like the second son in the parable of the two sons in the vineyard (Matthew 21:28-31). We say yes, but we act out no. God prefers honesty. We would be much better off if we would say an honest no to whatever God is asking, for the next step could be repentance. An honest no will lead us to the discovery of how destructive it is to say no to God and to a real hungering and thirsting for righteousness. Jerry was a member of a support group I was leading. He was cheating on his wife, but he kept saying that he was sorry and that he really didn’t want to be an adulterer. He really wanted to obey God; however, as much as he said that, he didn’t change. He wanted to believe that he wanted to change without doing the work of change. Tired of hearing how much he wanted to be different, I suggested that he tell God and the group the truth. He really did not want to change, he enjoyed his affairs, and his real wish was that God would take His rules and go somewhere else. Jerry was taken aback, but gradually began to see how true this was. Finally, he told the truth about his lack of love for God and how he really wanted to do his own thing. At first this admission scared him. He was giving up the falsehood of seeing himself as a Christian who cared about holiness. But his honesty felt better to him than all the lies, and something began to happen. In the safety of grace, which was allowing him to see himself as he really was, he began to regret who he was. He began to see the emptiness of his heart. When he owned who he really was from his heart, he did not like himself. He was developing godly sorrow, the kind that leads to repentance, and he began to change. He told his lover that he was not going to see her any more, and he made a new commitment to his wife. This time he meant it. Whereas for years he had been saying yes and acting out no, he finally owned his no to God directly and honestly. Only then was change possible. Until we can own our boundaries with God, we can’t ever change them or allow Him to work with them. They are hidden and not communicated. They need to be honestly owned, exposed, and made a part of us. Then, we and God can face the problem. In our deeper honesty and ownership of our true person, there is room for expressing anger at God. Many people who are cut off from God shut down emotionally because they feel that it is not safe to tell Him how angry they are at Him. Until they feel the anger, they cannot feel the loving feelings underneath the anger. Job wanted to fully express his anger and disappointment with God to God (Job 13:3). But before he did this, he had to be sure of two things. He wanted God (1) to withdraw His hand of punishment and (2) to start communicating with him (Job 13:21). Job knew that if he were secure in the relationship, he could tell God what he really felt. We often fear being honest because it was not safe to express honesty in our earthly relationships. With Job we fear both abandonment and retaliation. People abandoned us or attacked us when we told them how we really felt. Rest assured, however, that God desires truth in our “inner parts” (Psalm 51:6). He is seeking people who will have a real relationship with Him (John 4:23-24). He wants to hear it all, no matter how bad it seems to us. When we own what is within our boundaries, when we bring it into the light, God can transform it with His love. 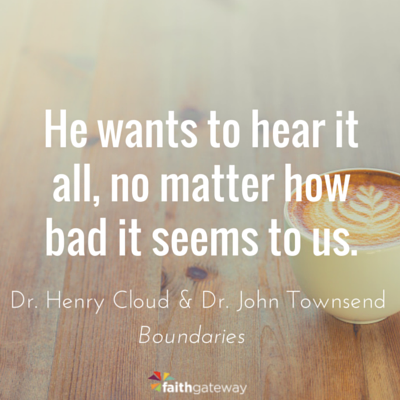 Excerpted with permission from Boundaries by Henry Cloud & John Townsend, copyright Zondervan, 2002.